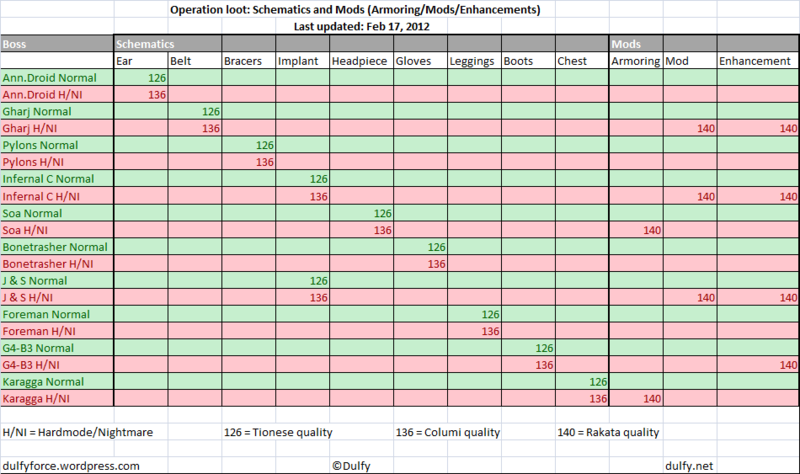 Hey everyone, there has being some requests for schematics/mods (armoring, mods, enhancements) drops from operations – especially now that there is a big movement to use orange moddable gear and crafted stuff that that crits (give augment slot). Over the span of 2-3 weeks, I have cataloged the following drops – everything that I have recorded will say (verified) and will list the exact drops I have obtained below. Drops predicted based on the loot pattern will say (predicted). If you are looking for tionese/columi/rakata drops from operations, please consult this guide here. Hardmode/Nightmare drops schematics that produce items with 136 ratings – Columi quality (also called Exo or Exo-tech). In addition, Hardmode/Nightmare will drop Q25 (Rakata quality) armoring, mods, and enhancements. Update – Feb 23 – Added new drops from this week’s raid – Infernal Council and Jarg & Sorno has being confirmed to drop both enhancements and mods. This means in theory that both 2nd and 4th bosses of each raid instance can drop either enhancement or mod but atm G4-B3 only dropped enhancement for us. I have seen Soa Normal drop Schematic: Energized Headpiece. I don’t remember which item, but it was a pattern for the helm slot. Cool ty for the verification! We managed to get Rakata Belt and Bracers schematics somewhere in EV Hard Mode. Are you sure you didn’t just learn those from the trainer? Armormechs and Synthweavers can learn Rakata belts/bracers from skill trainers. I can confirm that Annihilation Droid XRR-3 on normal mode drops Tionese earpieces, as I received a schematic last week. EV Hard mode dropped Columi Eliminator’s Implant schematic last night. Sorry, forgot to say – off of infernal council. Is there any difference between the drops on HM and NiM? Also do you know where exotech stims and adrenal schmeatics drop? I can verify that Hard Mode Karagga drops Advanced Reflex Armoring 25. Got it last week off him. Hey dulfy! Love the site. can you also update this with explosive conflict drops as well? Are there any schematic drops in TFB? I think that SM is Rakata, so likely not any ability to RE for schems. Maybe TFB HM would give drops that could be RE’d? I’ve seen crafted endgame mods,armor, enhancements on the GTN. How do you get these? Is there a schem for them, or can you RE the mods in this list to learn the schem? Is this also true for the Black Hole implants that you buy from the comm vendor? yup, I RE’ed about 3 of them and didn’t get any schematic so i gave up but my guildies have gotten schematics the first try. thx for the info, so the mod 25 we get from REing BH gear are .. BH quality ? or can we only RE level 26 mod and theres no way to craft the 25 one ? Still no love for PVP’ers, Why must PVP’ers do campaign do get the best gear? We should be able to get schematics by achieving something in PVP. Is Soa stil dropping schematics? Can’t seem to find helm’s that look like the old Tionese so gonna have to craft them if still possible.